Full Computerized Knitting Machine Series. 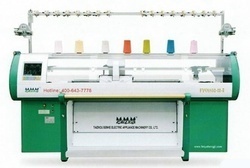 This series is table- less computerized flat knitting machine. 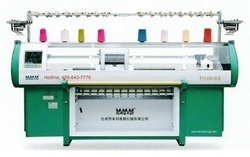 Digital technology is adopted to realize transfer, tuck, pointelle, jacquard, open narrowing and other regular patterns. Basic knitting fabric, multi-color irregular jacquard, cabling and other weft knitting fabrics can be knitted. It is applicable to weaving sweaters, coats, scarves, caps and cloth accessories which are made of real silk, spun silk, compound silk, wool, acrylic, etc. Basic knitting fabric, multi-color irregular jacquard, cabling and other weft knitting fabrics can be knitted. It is applicable to weaving sweaters, coats, scarves, caps and cloth accessories which are made of real silk, spun silk, compound silk, wool, acrylic, etc. Two system can work together or separately, one for knitting and the other for transfer. Whole garment weft knitting fabrics such as single-side, full needle, multi-color irregular jacquard, intarsia, cabling, etc. can be knitted. It is applicable to weaving coats, scarves, caps, artware and cloth accessories which are made of real silk, spun silk, compound silk, wool, cashmere, acrylic, blends, yarns, etc. One working system is added on the basis of the double system. Threes system can work together or individually, thus improving production efficiency greatly. 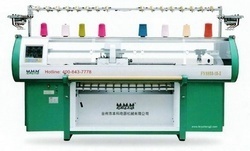 It is designed for jacquard fabrics and shows higher work efficiency. It is applicable to weaving coats, scarves, caps, art ware and cloth accessories which are made of real silk, spun silk, compound silk, wool, cashmere, acrylic, blends, yarns, etc. 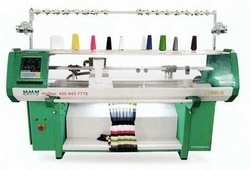 This series is the computerized flat knitting machine with take down comb. Advanced scissors, clip and take down comb are added on the basis of the double system series. The machine includes two scissors and four clips which are controlled by the six motors separately. The program instruction can be executed simultaneously or separately to increase the production efficiency and reduce the waste of yarn. 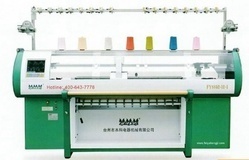 This series is the computerized flat knitting machine with take down comb. Advanced scissors, clips and take down comb are added on the basis of three system series. The program instruction can executed simultaneously or separately to increase the production efficiency and reduce the waste of yarn. The take down comb adopts closed U type compound needle to hold and knocks over the yarn relialbly. 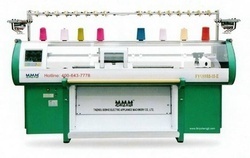 16 yarn feeder and the advanced digital control system are adopted to realize whole-garment weft knitting fabrics such as single-side, full needle, multi-color irregular jacquard, cabling, pointelle, etc. It especially has the powerful function of producing intarsia. It can make 15-color intarsia. Even the most complicated intarsia fabric is easy for it. 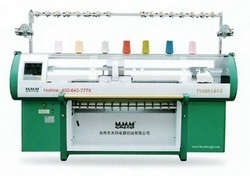 Triangle bottom board and needle bed with unique design work cooperate with the digital system to realize the whole-garment weft knitting fabrics such as single-side, full needle, multi-color irregular jacquard, cabling, pointelle, etc. Different gauge can be knitted on the same fabric. It is applicable to weaving coats, scarves, caps, artware and cloth accessories which are made of real silk, spun silk, compound silk, wool, cashmare, acrylic, blends, yarns, etc. Automatic high-speed yarn feeder which is between yarn bobbins and weave system can short yarn trip, which effectively reduces the yarn resistance. Automatic pre-storage yarn function can detect broken yarn effectively and warn quickly which guarantees the high quality of the fabric. User-friendly designed operating interface, Large-capacity memory and stable performance to make the operation easier. Every triangle bottom board has three functions, which are circle knitting, doubling knitting and missed loop. Meanwhile, every system has the function of transfer and needle connecting. Triangle can switch swiftly and quickly. It also can control the position of every needle. Smoothly controlled by the torque motor, it not only can weave different styles of fabric but also can reduce the damage of the fabric by pulling the fabric softly while weaving. Three groups of the compound triangle organization, proper promotion of the main motor power and special needle selection of eight-segmentation electromagnet will lead to the lower power consumption and higher efficiency during the weaving. So it substantially reduces the cost of the production. Side tensioner is the last yarn tension controller. When the yarn is running, side tensioner can monitor the yarn and give it tension. At the same time, it can put away the loose yarn caused by the reversing of the carriage and some other factors during the weaving. 8 pcs of the yarn nozzle can be used by any weaving system and they can change their position freely. According to the different weaving speed, controlling programme can adjust the stop position of the yarn nozzle. And special for weaving intarsia also can be fixed. The scissor and clips can cut the yarn which connects two pieces of fabric to reduce the waste of yarn and avoid the damage of the fabric. Sinker controlling system can be control each sinker which is fixed nearby the needle. So the sinker can control the old coil and new yarn of each needle to improve the quality and appearance of the complex fabric. Controlled by the torque motor which can meet different pull requirement of fabric to make the fabric look more beautiful and uniform. While re-starting, it can reduce the waste yarn effectively, lower the production cost and improve the production efficiency.